We here at Spook Shop are excited to get in a new costume that will hopefully have our customers feeling wistful for rolling hills of heather, some haggis, and strong pint to wash it down with. That’s right, now you can channel your inner Scot with our Men’s Kilt costume. This kilt costume comes as a complete outfit, sporran and all, in a bold red tartan. Of course, not to leave the girls out, we also have Scottish Lassie version. I don’t think anyone told this particular lassie what the weather in Scotland is like…..
All this Scottish pride got us thinking about the role Scotland has played in Halloween’s origin. Most people know that Halloween is derived from All Soul’s Day, but the story of how that Christian holiday was born out of a pagan celebration is a little less known. Samhain (pronounced “sa-wane” and also spelled Samhuinn) was an ancient Celtic ritual held on October 31st of every year. It marks the end of summer and light and begins the transition into winter and the ‘dark half’ of the year. At Samhain, fire plays a large role in the practices and festivities. Of course, in modern-day re-enactments, the massive bonfires are more for dramatic effect of the ritual presentation, but for centuries, lighting a fire during these times between seasons served as a protective measure against witches, fairies, and other supernatural beings. It was believed that contact with the otherworld and afterlife was heightened during this time of transition and people were vulnerable to attacks from spirits. Thus the fire would ward them off, while also walking through two fires or being immersed in the smoke of a fire would purify and cleanse people as they prepared for the darkest part of the year. This widespread use of fire to mark transition however, slowly died out among the British Isles with the emergence of Christianity, and Samhain was eventually Christianized into All Soul’s Day because of its correlations with death and darkness. 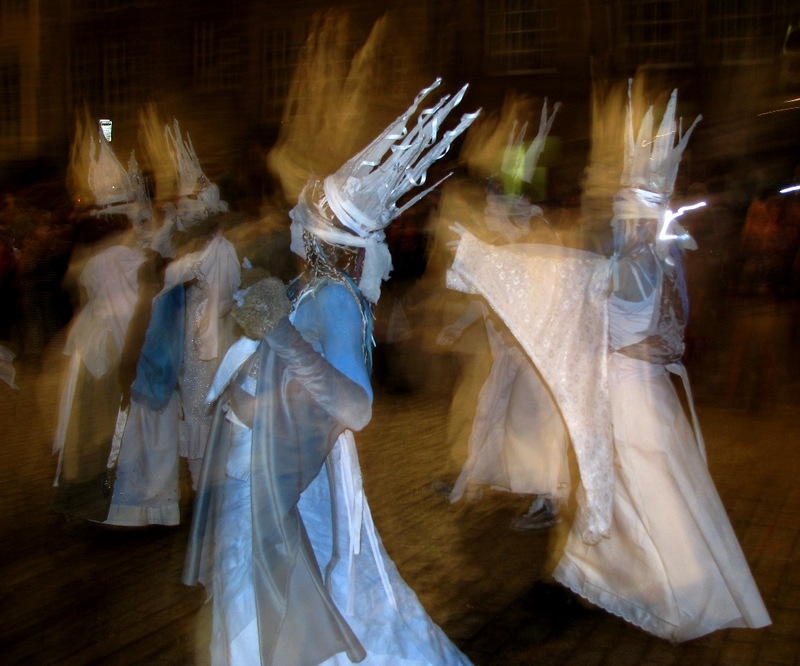 In 1988, the Beltane Fire Society in Edinburgh, Scotland, reintroduced the traditions of Samhain as a community arts project and shared them with locals and tourists through street performance theater. The festival has since turned into a huge communal event, with hundreds of people volunteering to be a part of the performance. The modern-day festival of Samhain still carries on the same themes of death, darkness, and the otherworld. A character known as the Green Man, or the Summer King, is killed by a Cailleach, or Winter Witch, thus symbolizing the end of harvest and the summer. The Society’s performance involves hundreds of painted and costumed people who dramatically reenact the demise of summer. One of the Society’s member’s, Matthew Richardson , captures a common theme among many types of folklore as he describes Samhain: “The two characters fight to the death, winter overcoming summer as inevitably as the seasons, but the mysterious healer steps in to revive the summer figure, thus ensuring the return of spring and light.” The reenactment continues the following May, at Beltane (the Celtic version of May Day), where the Green Man emerges as an old and frail figure. A new character, the May Queen, representing spring and fertility, is introduced at Beltane and she eventually breathes new life into the Green Man, so that summer can begin again. Many other performers, painted green, blue, white, and red, represent different elements, such as Earth, Water, Air, and Fire, and each group has a performance of its own. While the festival of Samhain has been embellished in present times to include many other aspects of Celtic and pagan mythology, this festival, as it did in the past, plays a large role in bringing the local community together (as well as thousands of outside spectators) and marking the coming of winter in a very prominent way. See all of our Scotland-inspired costumes at Spook Shop.